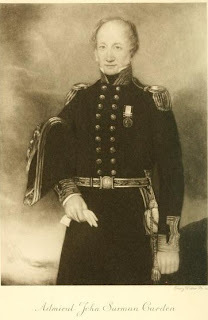 Admiral John Surman Carden (1771-1858) of the Killard branch is mainly remembered as having surrendered HMS Macedonian to a vastly superior American frigate, the USS United States in 1812. He wrote some amusing and exciting memoirs which read like a Patrick O'Brien book and can be downloaded from http://www.archive.org/. His father, Major John Carden, was in command of British forces at the Battle of Hanging Rock during the American Revolutionary War, and later apparently faked his death in battle in order to marry, bigamously, a Miss Judith Wragg in Charleston. See the story in the Report on the 1998 Carden Gathering. Mark Robinson is writing a biography of Major John Carden. 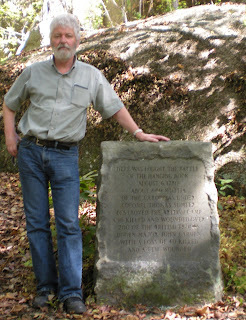 He is seen in the picture (in October 2009) next to the plaque at Hanging Rock which commemorates the battle and mentions Major John Carden.